An Arroyo Grande day care center closed its door abruptly after state authorities revoked its license to operate because of numerous health and safety violations. 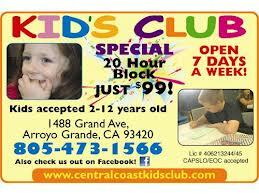 Officials from California’s Department of Social Services cited the Kids Club day care center on Grand Avenue for failures to have the required number of staff, run criminal records checks and provide the minimal required activities for the children in its care. In mid-January, 18 children were left in the care of one employee, the complaint says. On Aug. 27, Kids Club staff took the children on a field trip without obtaining permission from the parents. The staff also failed to provide the children with water during the excursion, according to the accusation. State investigators also allege that Kids club operators Nathan and Linda Belch failed to properly maintain the center which was found to have damaged sleeping mats and food on the floor during an inspection. On Jan. 28, the couple agreed, among other things, to make sure the children were properly supervised at all times. Following that conference with regulators, the Belchs were cited for an additional 18 violations, according to the complaint. As a result, the state revoked their license on March 19. Now that CAPOSLO has cornered the market on the homeless in this county, is it possible that they’re now going after the childcare industry? I’m about as anti-daycare as one could be….but these accusations sound like one disgruntled parent just got upset. I tend not to believe only 1 family; were there multiple parents who filed complaints? Folks, if you’re gonna warehouse your kids at a place with 18+ other children, you really better know and trust the people in charge. Very sad that many parents are working and have no family/friends to watch their little ones. Of course the larger problem is that families need day care at all; but that is another topic for a never time. Parents don’t need daycare just quit your jobs and get on a government plan. With a little pencil whipping Obama will give you unemployment, a cell phone, and pay some of your mortgage until your kids are old enough for school. God bless America!!! Dragging your tea bag politics in to a Arroyo Grande daycare story. God did bless America and you are just going to have to deal with it. and the lone staff member perhaps did not have CPR cetrification as required by law? parents; what are you doing to your children? “Nathan Belch disputed the allegations and noted that many were minor or inaccurately reported. For example, on Jan. 18, the accusation states that one staff member was left to care for 18 children. But, Belch said, the second staff member had stepped into the lobby area to talk to a parent. In another incident involving the low supply of toilet paper on March 22, 2012, Belch said he’d just returned from Costco with more toilet paper, but that a state licensing inspector wouldn’t let him bring in the items. good point acknowledged. i would believe, as well, that regulators can be off-base.